It is located south of Manabí and is also known as "La Sultana del Café", because it is the main coffee producer in Ecuador. Among its tourist resources it has the beaches of Puerto Cayo. There are also thermal water wells, located in the Andil site; Choconchá and Joá, these last two considered as historical places. These wells have a snail shape. The corn and yucca tortillas of the Sancán site are well known for their varied gastronomy; the grilled and ceviche with peanuts. Its name is due to the fact that it was formerly inhabited by the indigenous Xipixapa tribe, although it is speculated that the Maya also spread throughout this region. What is certain is that the indigenous groups that inhabited what today is Jipijapa were victims of looting, fires and other abuses of conquistadors and pirates. The main activity of this canton is the production and export of coffee, as well as trade in its different forms and crafts. As tourist resources it has the beaches of Puerto Cayo, Municipal Cultural Center. Among the cultural, historical and folkloric aspects stand out the church of San Lorenzo and the religious manifestations that occur around the Virgin of Holy Water. In Jipijapa, tourism has good places to visit such as: the freshwater waterfall, the fresh water wells in Andil, the sulfuric water wells of the Chocotete volcano in Joa, the waterfalls in the Anegado, the gastronomy one of the most striking and representative at a national level The Ceviche with Mani and avocado, special bun, gruel, additional The beach of Puerto Cayo and for lovers of monuments "La Gran Mazorca" which is located on the outskirts of Jipijapa on the road between Portoviejo and Manta representing the agricultural culture. Julcuy is located in the mountains of Jipijapa, access to the place is possible after a trip on the highway Jipijapa-Guayaquil and advance on a paved road. The investigations determined that in the place, crossed by the Julcuy River, settled the Valdivia, Manteña, Machalilla, Bahía and la Chorrera cultures. This is why Julcuy was designated as cultural patrimony of Manabi. The cave of the tigrillo, named for the site, where these are, we can see in this sector that there are caves that were inhabited by ancestors. An unparalleled natural area shelters several rural communities of El Anegado, in this case to reach the Cascada de bajo Grande, which remains an emporium of greenery and crystal clear waters and incredible waterfalls in which the currents of the river called the Cancagua feed the river Paján, indicates its inhabitants who are ready to guide their own and strangers and be part of that rebirth of the living biodiversity that surrounds this territory located 8.6 km from the parish seat, with a path that has no greater difficulty mobility and if anyone wants to live an adventure they can contact guides who have been trained and also prepare Creole dishes. The Marylan Waterfall measures approximately 150 meters divided into three falls in the form of a staircase, uniquely married to the one known to date, the entire floor is greenish-blue colored stone, there are heads of animals sculpted next to the fall of water. The perpendicular shape of the waterfall allows the fall of the water to be smooth and bearable to the human body, to enjoy a comfortable and recreational bath. A dry forest of the Costa region. 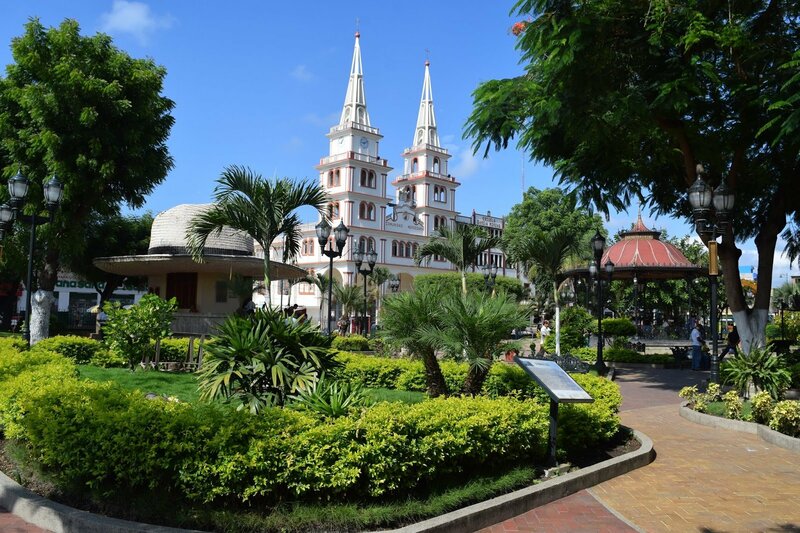 The wide landscapes in the south center of Manabí, in particular in the town of Membrillal, offer a unique spectacle that together with the sunlight, marvel eyes alien to this beautiful land. Andes visited this area of ​​the so-called country of the 'Cuatro Mundos' where there is a unique dry forest. With a clear sky and a pleasant dry warm sensation, Membrillal receives the visitor of this parish, where its inhabitants have had to learn to coexist with their changing climate. The habitat of this site has endemic species that are not very hardwood, however, indiscriminate felling has reduced these species in the area. Despite long periods of drought, life finds a way to flourish in this place. The so-called "amarillitas", as they know this flower in the locality, is one of the plants that has spread through most of this landscape. This Islet of 500 square meters is an ideal place to practice snorkeling, it is accessible by boat from the town of Puerto Cayo and it is in this place that you should hire the specialized service for this activity, this Islet is part of several surrounding attractions whose value lies in the warmth of its waters, the reefs present and the ease of access. Located off the coast of Puerto Cayo, 10 minutes of navigation is located south-east of the lands of Manabitas. The surroundings of the Islet are discovered and of slope. Surrounded by cliffs and tropical dry forest habitat of pelicans and frigates. The sea surrounding the islet is turquoise blue due to the large amount of white coral that lies at the bottom, the surroundings of the islet are conducive to the practice of snorkeling and diving, its seabed is very attractive where you can see the diversity of marine fauna that owns the place. In the northern sector there is a small beach of dark sand where it is possible to see a small colony of blue footed boobies, frigates and pelicans, it is possible to access this Islet from the town of Puerto Cayo, in this place it is possible to go hiking and camping , this small Islote is part of the Machalilla National Park. MAIN ACTIVITIES THAT CAN BE CARRIED OUT IN THE PEDERNALES ISLOTE. Sighting of seabirds, among others. The Pedro Pablo Gómez petroglyphs are located on the slopes of the Santo Sin Cabeza hill, on the road that leads to the Marylan waterfall, 4.5 kilometers away from the parish. It seems that they correspond to the Manteña culture. Some engravings in stone symbolize valdivias, a bird of prey of the family of the owls. It appears represented only with the head and can be associated with divinities related to death. The path leading to the petroglyphs has a transition forest with lush vegetation and tree species such as rubber, tillo, morale, ebony caraca, guayacán, cativo, pechiche, majagua, garlic, river mangrove, guabo, yellow, balsam , royal palm, cabo de ax, guarumo, cane guadua and tagua. Its varied gastronomy are very well known corn tortillas and yucca from the Sancán site; the grilled and ceviche with peanuts. Among the typical dishes of this canton are the gruel, the bun, corn tortillas.